Greet your colleagues as we welcome everyone to Washington and this traditional kick-off to the conference. Emory Kristof is a pioneer of innovative underwater photography using robot cameras and remotely operated vehicles (ROVs). Kristof created the preliminary designs for the electronic camera system for the Argo ROV, which first photographed the wreck of the Titanic. He led photographic surveys of the Confederate warship Alabama off the coast of France in 1992 and the 16th-century wreck of the Spanish galleon San Diego in the Philippines in 1993. 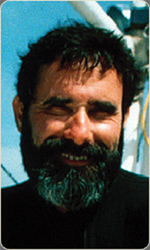 In 1995, he led an expedition to recover the bell of the U.S. freighter Edmund Fitzgerald and produced the first high-definition TV footage of the deep sea. After this presentation, Kristof heads off to Indonesia in search of new species! The Marine Technology Society (MTS) Annual Awards Luncheon provides an excellent venue for meeting and networking with colleagues and other MTS members. MTS President Jerry Streeter will present the annual State of the Society Message. Along with Lockheed Martin Corporation, Compass Publications, and Rolex, he will confer the Society’s annual awards. This luncheon is included in the full conference registration. All others will need separate tickets purchased in advance. We welcome Mr. James Connaughton, Chairman, Council on Environmental Quality, and Chairman, Committee on Ocean Policy, in the Executive Office of the President as our Keynote Speaker. 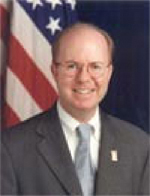 Mr. Connaughton leads the U.S. Government’s implementation of the U.S. Ocean Action Plan, and we look forward to his remarks about the future of U.S. ocean programs. The annual awards luncheon for the Institute of Electrical and Electronics Engineers (IEEE) Oceanic Engineering Society (OES) provides a wonderful opportunity to make plans to have lunch with your colleagues and other IEEE OES members. OES President Jim Barbera presides at the luncheon and presents the Society’s annual awards. This luncheon is included in the full conference registration. All others will need separate social event tickets purchased in advance. Join us for a wine and cheese reception and special presentation about the upcoming Smithsonian Institution’s Ocean Science Initiative (OSI), which will revolutionize how we educate and reach out to citizens of our global ocean society. Dr. Robert Sullivan will tell us about plans for OSI and the truly magnificent Ocean Hall that is now under construction at the Smithsonian Natural History Museum.